Walking is a great way to keep fit and to keep the whole family entertained. Older people with mobility problems, however, may feel that they cannot go out walking because of their disability, but this is far from the case. 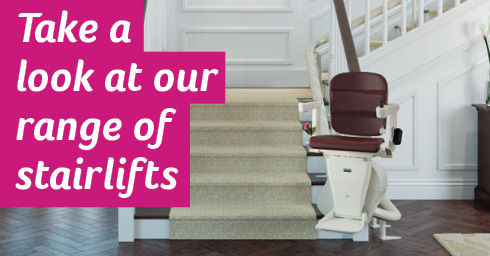 Now people with mobility problems who need aids like a new stairlift around their home can enjoy walking on accessible routes which take in the coast, gardens, rolling countryside and rugged moorland. Take a look at this guide on the best and most accessible routes, including walks that are suitable for visitors with mobility aids. There are lots of railway lines that are now popular walking routes around the UK and many of these are very accessible to walkers with mobility problems because the routes are flat. “Many old railway lines have been turned into excellent accessible walks in the North West of England. The most famous is probably the Monsal Trail which runs from Chee Dale to Bakewell and is full of historical and natural interest. Other lesser known, but equally good trails, including the Tissington Trail and Middlewood Way, both are flat and the latter has beautiful wildflowers in Spring. Mam Tor in the Dark Peak is a little more challenging due to the rocky staircase to the top, but for a very short walk, you get stunning 360-degree views of the Edale and Hope valleys! Forged by nature and shaped over generations, the North York Moors offers walkers virtually everything you could want to see: moor, coast, forest and dale. There is so much heritage and wildlife in the national park and there are so many routes you can follow during your visit to the region. This is a predominantly flat route with stunning views of the ‘finest view in England’. The Sutton Bank National Park Centre is complete with parking, café and nearby toilets, making it a great place to take your time, relax and refuel. Laura Barr also recommends the accessible Farndale trail in the North York Moors National Park. This is a flat route offering stunning views along the river, with the Daffy café and pub in Church Houses. Located in the heart of Devon, Dartmoor’s ancient landscape is famed for its stunning views, wooded valleys, granite tors, flowing rivers and, of course, its ponies! Walking here will truly relax you and if you are on a family day out there are areas that are quiet and are perfect for a picnic. Those of you with mobility problems can still enjoy everything that Dartmoor has to offer as there are lots of easy to follow trails you can stroll on. Here are some of the great routes you can follow. The reservoir is on the south side of Dartmoor is a great day out for families, nature enthusiasts and historians. There are abandoned farms, old tin mining examples and even the remains of a railway within easy reach from the reservoir. The 1.6-mile circuit gives walkers unrivalled access to the Lake District’s first wetlands nature reserve at Dubwath Silver Meadows and is a wildlife haven for nature lovers and bird watchers. The boardwalks, which are actually made from recycled plastic bottles, provide access for wheelchair users and walkers with limited mobility. Along the route, there are viewing points and hides and during spring you will be able to see a whole host of birds in the wetland. During this time of year, you will be able to see all the unique flora and fauna coming to life after the winter months. There is also a 200-metre path at Ouse Bridge which gives visitors with mobility issues access to Bassenthwaite lakeshore. There is a walk-on offer for people with limited mobility at Knole and along this 3-mile trail, you will get to see Kent’s only remaining deer park. Spring is the perfect opportunity to visit this iconic trail as the weather improves and temperatures begin to rise. As well as the fallow deer herd, which have been living here since the 15th century, you will also get to see the impressive Knole House, impressive countryside views and dominating woodlands. The route is great for walkers with mobility problems as it is predominantly flat and takes 1-2 hours to complete. If you are a dog owner, then you can bring them along too!